When Yvonne Studley, age 49, was hit by a moose in British Columbia, Canada, she was very badly injured. The moose she hit came through her windshield, landing on her. The crushing impact caused Studley to break her wrist, arm, and hand; fractured five of her ribs; and caused bleeding in her brain which put Studley in a coma. However, when Studley woke up, the first person to head out to visit her at Vancouver General Hospital was her sister, Connie Everitt, who drove down from northwestern BC to visit her sister. Little did Ms. Everitt know she’d soon be in the hospital alongside her sister. 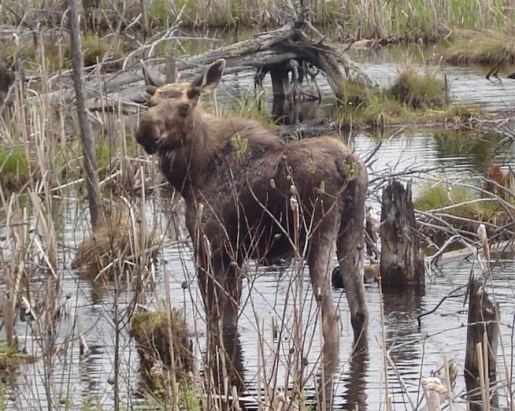 The woman whose sister was hit by a moose was herself hit by a moose. Someone alert Canada’s minister of irony, Alanis Morrissette! Fortunately, Everitt’s injuries were not severe; she was released from Vancouver General Hospital a day later; Studley is still recovering from her injuries. According to the Wildlife Collision Prevention Program, about 8 percent of all wildlife/vehicle collisions in Canada are the result of murderous moose, who run alongside roads to avoid cars. Between all the moose and all the angry deer, Canada has to be a dangerous place.